What you can do then? For the mean time, use other browsers like Opera or Chrome until there is another update by Greasemonkey that fix this problem. Or you still insist want to use Firefox? Then you will need to downgrade your Greasemonkey version. How to do it? First, uninstall your Greasemonkey add-on in Firefox then restart your Firefox. Then go to install version 0.9.18 instead. you might need to reinstall the user script too. Please note that your friendly Firefox will try to help you update the Greasemonkey to the latest version if you restart Firefox. Let’s keep our fingers cross that Greasemonkey release an update to fix this mess. I will update you all when a better solution found. As you all know Firefox screw the script again. During version 1.23, Firefox update cause unsafe windows broken down and I force to use Content Global Reader in version 1.24. Now Content Global Reader stop working in Firefox when MouseHunt running in Facebook frame. So I use back unsafe windows which now can be used again. What a joke. Thing is running now. I also fix some minor problems when player sound the horn manually. Check the changelog for more detail. Sorry, no mobile page version supported for this version yet, as I’m too busy with other stuff. It will be a long delay for this feature to come. No worry, I will still spend some of my time to fix some major bug if there is any. Fix Firefox unable to run correctly in Facebook frame. Fix page refresh unnecessary problem after player manually sound the horn. Fix automatically reset the timer after user sound the horn manually before the timer reach zero. 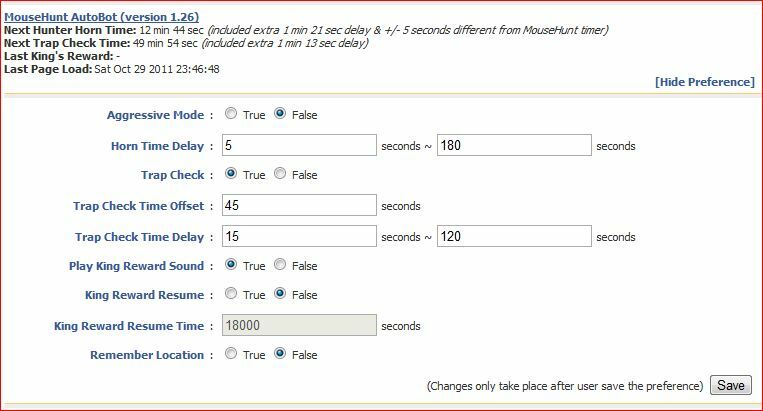 I also fixed the trap check delay time bug and add hunt location preference setting into the game for this version. Sorry for all the bugs and small patch. Enjoy the game. Just a quick fix for secure connection problem in Facebook that cause the script unable to work. Sorry about that. Some new players not familiar with the script so I also add description for each preference. Just mouse over the preference, the tooltip will give more information about it. Just a minor update this time, enjoy the game. Fix script unable to run in Facebook secure connection (https). Add preference description in tooltip for each preference. Fix some incorrect preference setting default value. Fix Firefox unable to play King Reward’s sound correctly. Fix some memory leak problems. Fix Opera unable to play King Reward’s sound continently (Note: There will be a big gap between the last sound end and the new sound begin). 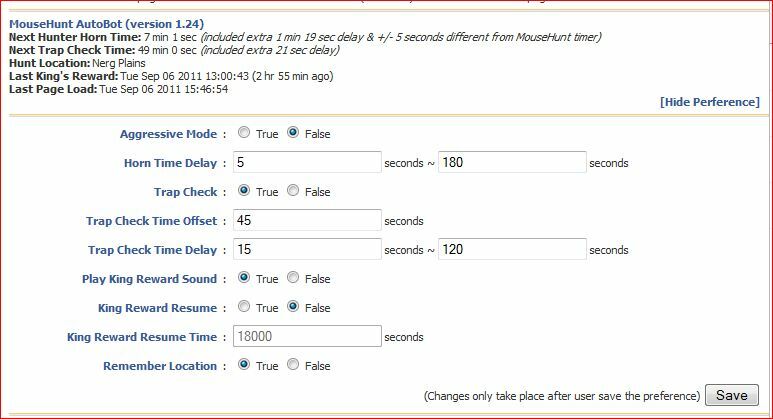 Fix script will now auto reload if encounter any MouseHunt intro page which is a bug in the game if player using Google Chrome. Fix script unable to work when showTimerInPage is set to false. Aggressive mode will now ignore any extra time delay set by player. Script can now automatically reset the timer after user sound the horn manually before the timer reach zero. King Reward music is now play direct from the script instead of stream it from other site (only for Firefox and Opera web browser). Player can now set preference such as horn time delay directly in game instead of editing the script. First of all, I would like to apologies for the memory leak problem in last version. I was in a hurry to push out the script without much testing. Thanks for those players who give me lot of feedbacks in order for me to fix the problems. No new feature in this version, just lot of bugs fixing this time. There are also bug fix for other browser as well, so make sure you use this one than version 1.21. Do tell me if you found any problem on the script. For Firefox user, do tell me how is the memory going. I guess you can go full speed boting the whole day with this version of script now. Enjoy. Sorry for the long waiting. I was busy with lot of stuffs recently and the development process was drag down by Opera and Google Chrome web browser for many days due to the sound problem. I only manage to fix the Opera but not Google Chrome. But I plan to release it without one new feature for Google Chrome because I really drag for too long already. Sorry Google Chrome fans! One of the big changes you will notice in this release is you can now set the script setting inside the game! So now you don’t need to learn how to set them by using notepad or what so ever. Be warn that those setting is not permanent if you just change it in the game, the script use temporary storage to store those setting only. In case if you delete all browser storage and cache, the setting will go away and back to what had been written in the script. So remember to change back the setting when you delete all browser storage and cache. Lot of players keep on asking me how to play music from local drive. The answer will always “You can’t because the script can’t”. The script just can’t access to the file system because of security reason. But don’t be so sad, now I embed the whole music in the script and it will now play directly without any streaming! Of course, the script size is bigger than before now because of the music data, but it will save your a lot of bandwidth later on. Too bad this feature only apply for Opera and Firefox web browser, Google Chrome will still stream the music for this version. Oh ya, I use some hex encoding on the music, so it is impossible for other to change the music unless you know how to modify midi sound to hex encoding. Another thing you might be notice is when you manually click on the horn, the script is now smart enough to know that you had press the horn and it will now start re-calculating the time. Thanks to some players told me the bug that the time is actually not correct if they press the horn manually. For other change, just read the change log at the bottom. Some time I really wonder why I need to fix all those bugs left by the MouseHunt developer especially on Google Chrome web browser (check out the version 1.20 and 1.21 change log). Ha, maybe I should drop them an e-mail saying your game need me because I’m helping you all the patch it. But wait, they hate me so much right because I developing a bot for the game! Well, who care to tell them anyway, I fix that because the player request me to do so. Oh ya, lot of Firefox users told me that there are memory leak in the script in Firefox 5.0. I don’t really experience that, and I can’t really figure out is the game problem or the script problem also. So if you are a Firefox user, mind to tell me if you got this kind of problem or not? Running with script or without script in the game? Thanks. 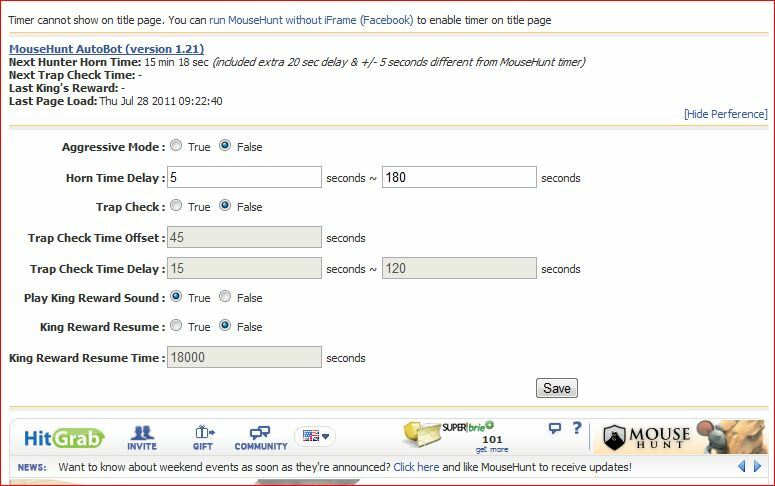 MouseHunt AutoBot is an advance user script to automate sounding the hunter horn in MouseHunt application in Facebook, Hi5 and offside MouseHunt page with MouseHunt version 3.0 (Longtail) supported and many other features. 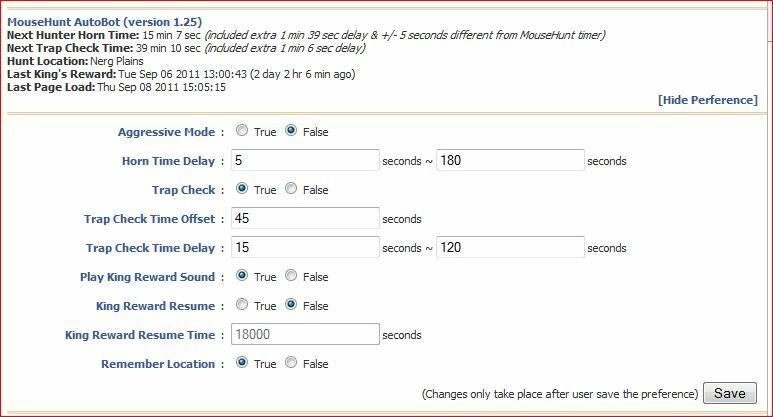 In a simple word, bot for MouseHunt. Time of next hunter horn and trap check will show on the webpage title. The time of the next hunter horn will automatically detected without refreshing the page again. Users can customize the script according to their need by themselves such as add extra random time delay before sounding the hunter horn. Users can choose to bot safety with many safety check features which act like a human, or bot aggressively. Part of the script is actually base on Facebook MouseHunt Game Auto Horn Blower. Opera only able to play King’s Reward once and not continently. OK, I know a lot of players are waiting for the next version of script to release. Sorry for the delay and the bad news is… the script is not ready yet. If you are following my blog, I was busy with some other events and holiday at New York, that is the reason why the script development get drag behind the schedule. There are still some development left and testing on version 1.21 before I can release it. Meanwhile, I will tell you what you can expect in the next version. Well, the script is not dying yet! King Reward music is now play direct from the script instead of stream it from other site. Tired of waiting the timer to reach zero when you manually click on the horn? OK, we reset the timer once you click on the horn now! Refresh? No need any more as the timer will re-calculate the correct time once you hit the horn! Have a slow connection to play the king reward music? Now we embed the whole music in the script and it will play directly without any streaming! Of course, the script size is bigger than before now because of the music data, but it will save your a lot of bandwidth later on. Oh ya, I use some hex encoding on the music, so it is impossible for other to change the music unless you know how to modify midi sound to hex encoding. Don’t know how to set the horn time delay or aggressive mode even after go through the long list of tutorial? Never mind, now you can edit those preference setting directly in game now! Just modify what you want and click save and you are done. No more opening notepad for editing. All preference setting will be save on browser as long as player don’t clean up the the cache in the browser. Well, you still can use notepad to modify the setting which will not affected by browser cache if you want. Are you finding the download link? The script is not ready yet! Come back to my blog another day to check if I’m done developing and testing it. Stay tune then.